Zuletzt geändert von Ignas.quattro am 20.12.2009, 18:22, insgesamt 16-mal geändert. Hey, nice car. Looks like its cold?? MTMOlli hat geschrieben: Hey, nice car. Looks like its cold?? Is your colour also Cyclan-red? Great Car! And nice pictures too! What's about (original) replacement parts in your country? And it would be very interresting too, to know how much you have to pay for such a car there. Hope you`ll enjoy your typ 44.
thanks Well , think of it as one of the most popular cars in Lithuania , not exactly sport version , but Audi 100(including before and after facelift and 100 C4 model also) , so I think there are enough spare parts in junk yards What about new original parts I don't really know yet , because I have this car for only a month now(hey , today is exactly one month ). But now I'm looking for TQ. I've always wanted TQ , but everytime I find a TQ , my father starts saying "Don't be stupid , too much power for you(a young driver) , too expensive , very unreliable..." and so on. thank you for your answear, too. I think parts could be send from Germany too, if you won't find something you need your country. Audi 100Q Sport S711 MC2 VitaminB Sondermodell "Wüstentarnmobil"
of course I meant all of "us", doesn't matter from where. All the great and classy pictures you made, I know you really like/love these monsters. This Community is a network with typ 44 or C4 drivers all over the planet. By the way, are you interrested in any other Youngtimer/Oldtimer ?. What's about "the old" BMW, MB or whatever...? 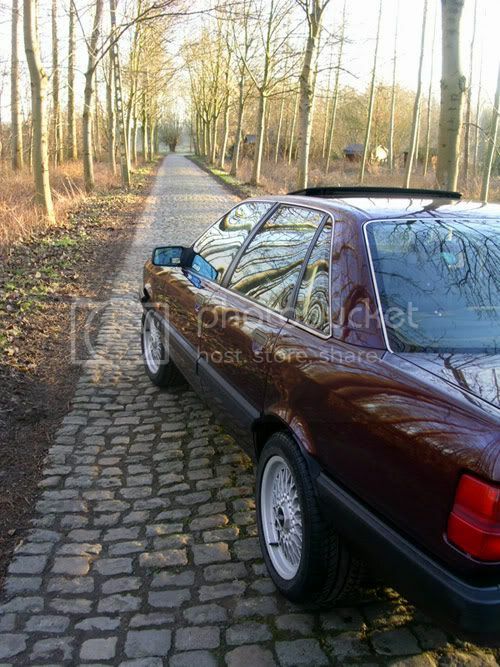 I'm very very happy that I found you guys , I remember when I was very young and was searching for Audi 100 pics , I entered this main site http://www.audi100-online.de/ and thought wow then I remember when I found some pics from typ44 meetings , it was so cool for me - so many typ44s!! And now I'm here , a member of this wonderful typ44 fans community! You have the feeling of a "professional photograph"
Zuletzt geändert von Ignas.quattro am 21.03.2008, 22:15, insgesamt 3-mal geändert. Florian K. hat geschrieben: Nice pix again. Yeah, the antenna really sux. Florian K. hat geschrieben: Yeah, the antenna really sux. 7.5 x 15 ET35, tyres: 215/60 15. Florian K. hat geschrieben: Yes. Okay, after putting them on, I think/hope the looking will be better. R 16 are definetly a good choice. Here is the car from this man.